I received "Billee The Goat" free of charge to facilitate this review. All opinions are my own. Every parent knows that teething can be a tough time on your little one, and in return, you too! Sometimes you just wish you could find that special something that could help sooth them and take away their discomfort. I have tried numerous tips and tricks to sooth my sweetheart, but sometimes what you need is a little help to get that tiny tooth to make its appearance. That’s why I am excited to tell you about Meeno Babies Soothing Teether called Billee The Goat! Billee The Goat is an adorable all-natural teether made with rubber from the Hevea tree. This teether is part of the Meeno Babies collection of the first ever all-natural teether toys that are BPA, phthalate, and paint FREE! How great is that! I love knowing that this teether conforms to safety standards of ASTM F963 and was specifically tested to prevent injuries from choking, sharp edges, toxins, pinching, colorfastness, color crocking, color bleeding and other potential hazards. Knowing that I am giving my daughter something that has passed all these tests gives me peace of mind. My daughter loves chewing on her pink Billee! She holds this teether in her small hands really well and loves to chew on all the different parts. From the textured neck to the rounded rings on his feet, there are a number of chewing surfaces to help your little ones teeth to come on out! She also loves how it squeaks! She giggles as the goat squeaks when she squeezes him. It’s so cute! I also love the fact that it is easy to clean! All you have to do is wipe it with a damp cloth and let it air-dry, and then it’s ready for use all over again. Easy peasy! It’s also nice that you can also choose the perfect one for your baby as there are 3 soft colors to pick from; pink, blue or yellow. Great for ages 0+. 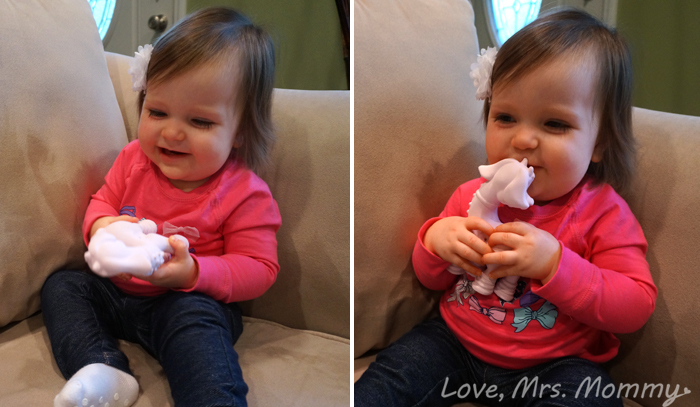 Your little one will be sure to love chewing on and squeaking Billee The Goat! Not only will it make them happier, you will be too. It’s cute, fun and soothing for their gums! Connect: Find out more about Billee The Goat and all of the other great Meeno Babies products by visiting their website, then make sure you “like” them on Facebook and follow them on Twitter. Buy It: You can purchase this teether online at www.MeenoBabies.com. That is cute. It looks like she really likes it too. I just got the pink Billee the Goat too! Such a great teether!